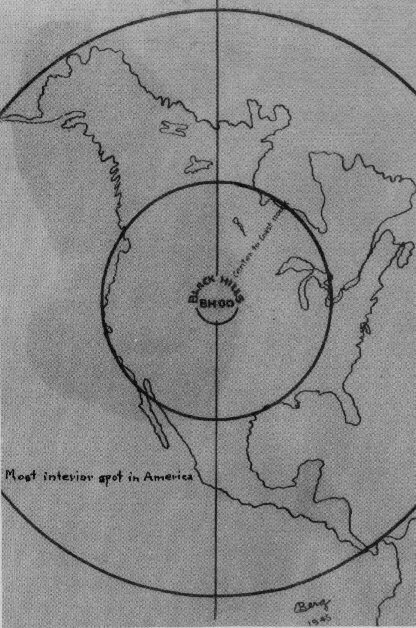 In the winter of 1941 a survey was started for a possible location of an ammunition depot near Provo, South Dakota. Then soon after, Government men were sent in to make necessary purchases of land. 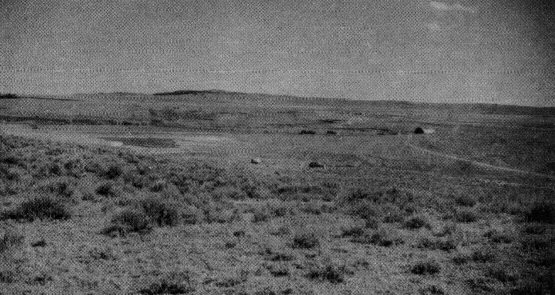 These completed, a large scale moving operation began as farmers and ranchers moved their buildings, livestock, equipment and supplies to new locations. 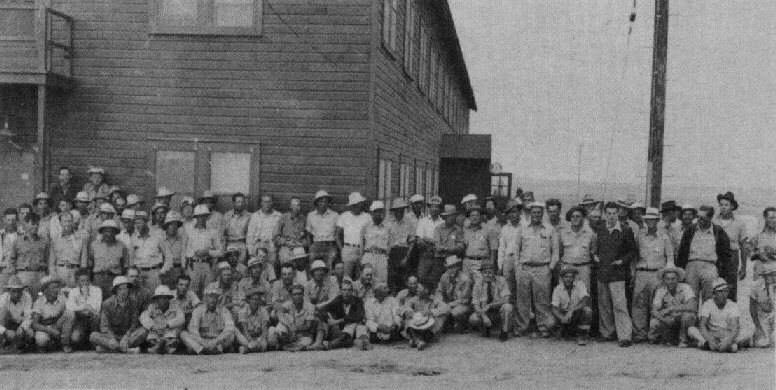 On January 9, 1942, a small party of U. S. Engineers came to organize and develop their procedures. The office of the Area Engineer was set up in the Armory at Edgemont on February 20, 1942. Among the first to arrive were Major Brown, Captain Hensgen, J. C. Patterson, Steve Berry, John Bailey, John Wright, Fred Schmitt and A. E. Flynn. The organization moved out to the area, into present building No. 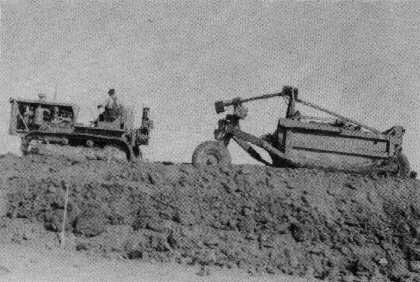 7, in the latter part of May, 1942.
the survey crews to the location site with caterpillar tractors. The resulting floods washed out the grade west of the classification yard in the General Supply area. Construction work began in earnest after about six weeks of inclement weather, the first grading was started adjacent to the C. B. & Q. Railroad near Provo. At the same time railroad Trestle No. 1 and Building No. 3 were being constructed. Manning and Martin, well contractors, began drilling Well No. 1 on April 4, 1942, and completed it June 6, 1942. This well went to a depth of 4,000 feet and produced very hard water at a temperature of 139 degrees. Previous to this time drinking water had to be hauled in by trucks and railroad tank cars. Drinking water was at a premium --- local well water selling for 10 cents a gallon. A very good water processing system was soon installed and good water is available now. A story interesting to the old timers is how the men lined up along the creek, made by the hot water from the well, some washing, some shaving, some stripped taking a bath and some washing clothes. Others would come with pails to fill and let cool for drinking. The distance between the men was governed by the activity of each person up stream. 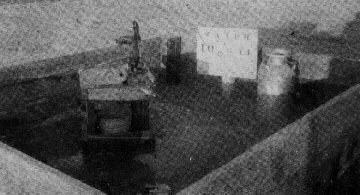 Actual pouring of igloo magazines was began May 30, 1942, the forms for Igloo B201 were the first to be set. During construction of the igloos, a new world's record was established by pouring 32 igloo arches in a 24-hour period. This was accomplished during the month of August, at which time a peak of 7,100 persons were employed on the depot, and it is believed that 7,099 of the employees tried to eat at the one mess hall on the area, which just to mention brings back many memories to the Old Timers. For instance, just how far can an arm stretch and still be fastened to the body. 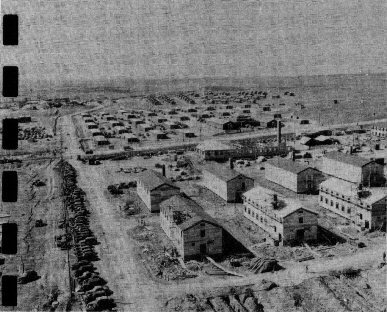 facilities at B. H. O. D. were long tar papered barracks with a row of cots down each side, housing from 50 to 100 men each. 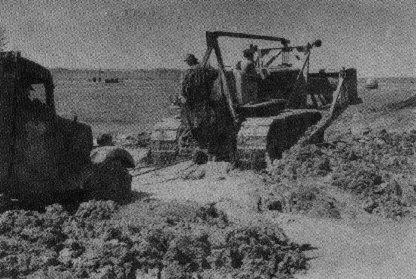 A large construction crew employing 75 to 100 "cats" and scrapers was building miles of road throughout the area. As fast the roadbed was constructed , a fleet of 450 gravel trucks were busy throughout the day and night hauling gravel from a pit four miles north of Edgemont for stabilization purposes. 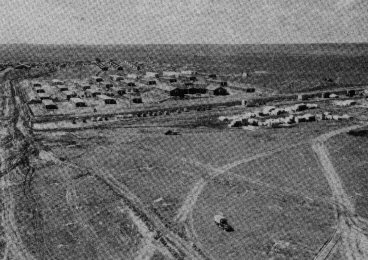 By the middle of September, 1942, the principal work was completed and many contractors were moving on. Minor contracts were being let for housing, utilities, and the like. The Ordnance Department took over on April 6, 1942, with Major Curtis as the first Ordnance Officer and the first Commanding Officer. Major Rice arrived on September 22, 1942, to become the first Post Engineer, whose duties were to organize and establish the Utilities Division. 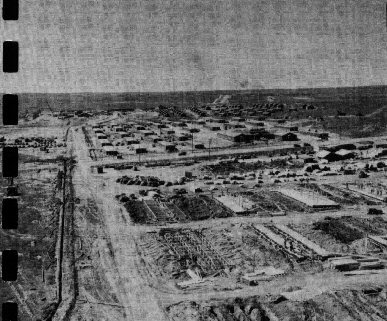 The first headquarters for the Ordnance and Post Engineers was in Barracks No. 110. Among the first employees to be hired by the Post Engineers were Stewart Mickelson, Chester Cahoe, Ben Geary, "Monty" Nystrom, Ralph Cypher, Mildred Purcell and Carol Goddard. Some of the first Ordnance Employees were Lee Johnsonbaugh, William Freund, Fred Schmitt, Tom Cubins, Fred Wheeler and Walt Herbert. During the summer of 1943 many homes were constructed; trees and lawns were planted. Later a fine school, a Child Welfare Center and a Community Building were constructed. Sidewalks were laid, streets were hardsurfaced and B. H. O. D. became a bright spot on what was formerly a prairie desert. During the early construction days no drinking water was available on this area. Water for drinking purposes was hauled by truck from Edgemont and Hot Springs and by railroad in tank cars from Belmont, Nebraska. Some shallow wells and cisterns existed at Provo but the supply was very limited and at one time this water sold for 10 cents per gallon. March 26, 1942, a contract was let for drilling deep well No. 1. Actual drilling operations began April 4, 1942, and was completed June 6, 1942, at a depth of 4,000 feet. Due to the water being hot, 140� F, it had to be cooled to make it palatable for drinking, which was accomplished by electric refrigerator bottle coolers; and for mixing concrete it was sprayed into open ponds to cool it sufficiently. Later a water treatment plant was constructed, where the water was softened and cooled, permanent water mains and services were laid and concrete storage tanks constructed, making the complete water system that we now have. Later a second well was drilled and the water plant enlarged to insure ample water for all future needs.